I found myself shoulder-to-shoulder with a bunch of sweaty rockers at the House of Blues on the Sunset Strip while they were complaining about needing a cigarette. We were all crammed in to see Alice Cooper and Ted Nugent blow the doors off the place. As everyone was grousing about the Los Angeles smoking ban, I could not help but chuckle to myself as I thought that if Johnny Ramone and Kid Rock joined them on stage, we would be at the one and only rock-n-roll Republican jam session. On September 15, 2004, it was announced that guitarist Johnny Ramone, one of the great independent-minded rockers, died in his sleep after battling prostrate cancer for five years. He was 55 years old. Born John Cummings, he was one of the founding members of the legendary American punk-rock band the Ramones (named after an alias that Paul McCartney used when checking into hotels). Johnny Ramone, was indeed, an unforgettable character. While the Ramones were being inducted into the Rock and Roll Hall of Fame in 2002, Johnny took his opportunity at the microphone to make his allegiances known. “God bless President Bush,” he said, “and God bless America.” Bedecked in his trademark torn jeans and black leather motorcycle jacket, he understatedly thumbed his nose at he lockstep orthodoxy of the rock establishment. Now, that is punk rock. 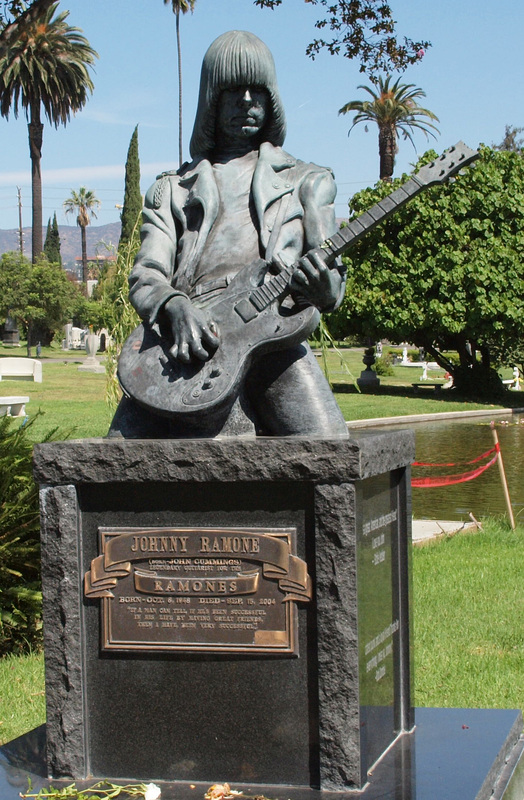 Ramone died only days after a tribute concert was held in Los Angeles to celebrate the band’s 30th anniversary. The proceeds went to the Lymphoma Research foundation and the Cedars-Sinai Prostate Cancer Center. Singer Joey Ramone died three years prior from lymphoma, and Dee Dee Ramone died from a drug overdose in 2002. Steve Beard is the creator and editor of Thunderstruck Media and a contributing author to Spiritual Journeys: How Faith Has Influenced Twelve Music Icons. This obituary appeared on National Review Online on September 17, 2004.